Sorry but low rates is the technic that I´ve employed in other freelance websites with excellent results. 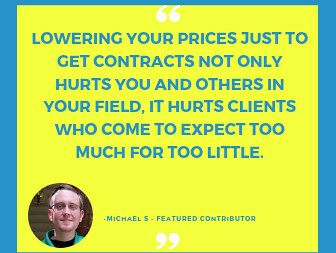 Chances are it worked on low quality sites where clients just want the cheapest nonsense. Those are likely also the kind of websites where you may get away with translating into your non-native language. This will also end in tears here. When she was turning on a corner she saw a lady trying to cross the street. There was also a man walking hurriedly behind her in suspicious way. Like someone else here mentioned, I think you need to specialise in English-Spanish, not Spanish-English. While your English is rather good, it's still error-ridden both on your profile and here. Most clients who post Spanish-English translations want someone who has native-level English skills, and won't tolerate one obvious error in your cover letter. This is clearly one reason why your cover letters aren't getting any responses. Keep a good attitude. Things will turn out better for you soon. Well, sorry, you are not giving up, you never made an effort in the first place. A few sentences thrown out, no portfolio, no work examples, full of typos and errors. 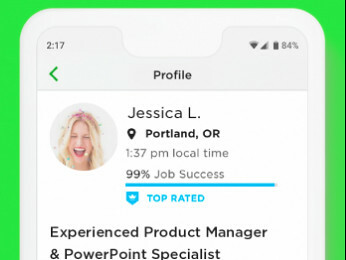 You have not taken upwork seriously, how do you expect a client to take you seriously? 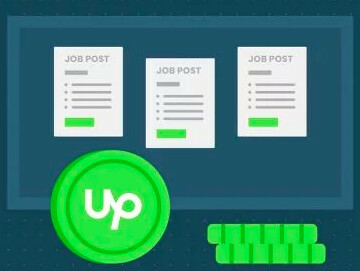 Claudio, besides using Martina's advice to better your profile, you should also try the relevant Upwork tests. If you're happy with the results, leave them under your profile, they will help prospective clients decide whether they should give you a job or not. If you're not happy with your results, you can hide them until you get a better mark. Anyhow, getting started on Upwork is difficult, there's nothing unusual about your story. What work could I show if I haven´t got any? Moreover I show samples of my previous jobs in every bid I send! Seems like if you don´t pay upwork you don´t get anything... Thanks god there are seious freelance websites!